What is A.D. The Bible Continues? From the renowned producing team of Roma Downey and Mark Burnett comes A.D. The Bible Continues on NBC – a landmark television event continuing where The Bible series left off. A.D. The Bible Continues starts with the Crucifixion and The Resurrection –catalysts that altered history. What follows is the epic tale of "A.D." chronicling several of the most intense and tumultuous decades in history. The complicated birth of the early Church was a time filled with enormous faith, persecution, political intrigue, brutal Roman oppression and the desperate Jewish revolt. The entire world was transformed, and the course of human history would be forever changed. A.D. The Bible Continues tells its story through the eyes of the Apostles, Pilate, Caiaphas, the Jewish Zealots and the Herod family. With the Book of Acts and Paul’s letters as its foundation plus some artful use of history, A.D. The Bible Continues shows why little has changed in two thousand years, but the church continues to change the world. 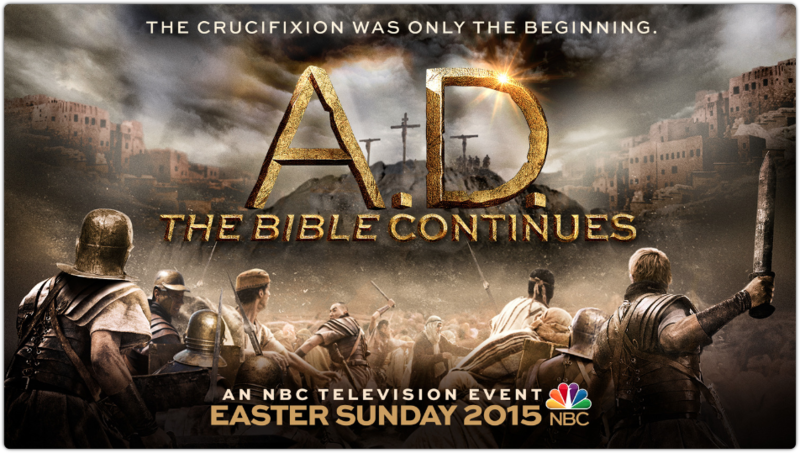 This Easter Sunday, April 5th, 2015, join millions of viewers for the premiere of A.D. The Bible Continues and continue on a 12-week journey through what would become the most powerful global movement in history – the rise of the Church. Click Here for more info about A.D. The Bible Continues! ​Watch the upcoming A.D. The Bible Continues TV series on NBC beginning Easter Sunday. Host an evening with neighbors and friends and use the God-Breathed book as a gift to those you invite as a great follow-through "share strategy." Encourage your high school or college ministries to get together to watch the series as a launchpad for discussion about the Apostles and the early church.